2012 is almost here and before the holidays we rolled out a string of updates and new features. And there is more to come in the new year. In this blog post we will highlight some of the smaller and bigger changes we have made to our site these past weeks. In 2011 we’ve been rolling out our new layout but there were still some parts of our site that needed to be updated with the new look & feel. For instance the editing & viewing pages and the general dashboard pages that you come across when you are logged in. There is now more consistency throughout the site and the sidebar menu takes up less space. Another thing that might be noticed by our Free users is that we got rid of the ads on our website as we think this this improves the general user experience and also the speed. In time we might experiment with some new sponsored content options that contribute to the general usability but for now the ads are gone leaving more room for new features we are working on. More noticeable for all our users: we have finally made the step to move the libraries to the sidebar. Some of the most requested changes regarding the libraries were the ability to search, see objects in 3D, have larger thumbnails and see more furniture at the same time. Because the amount of objects has been growing to an amount that was difficult to manage and oversee, a new search-based interface was necessary. 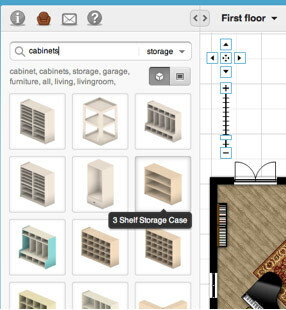 Tags will help you find more selective sets like “design”, “gymnastics”, “ikea” or “cabinets”. This hasn’t come without bumps and we are aware it’s still not perfect. We wish to thank all people commenting on the forums for their valuable feedback so far. In the coming year we will work towards more options for customization, like bookmarking items you use more often or furniture suggestions based upon the type of plan you’re making. Our libraries will be further expanding as always and get more specialized. We are open for your suggestions, just let us know! We started beta-testing our new 3D serverside renderings. This feature (PRO users only) allows you to create a more detailed, lively image from your 3D plans in high resolution. With a simple 2 click operation you can have images sent to you by mail in a matter of minutes. These images can be used in brochures and websites and have a quality that you would normally have to pay someone for to achieve. We are aware that there is a lot of room for improvement and that is why we are rolling it out as a beta so, as always, feedback is appreciated as we will further improve upon this. We can’t wait to see the images you will be producing with this new feature. Finally, we wish you all a very merry Christmas and all the best for the coming year. We have lots of new features and improvements lined up so drop by regularly. Happy planning in 2012!